Sedan, without CTS V, with adaptive cruise, 2014-15. Passenger side, without enhanced speaker system. Without night vision, with emblems on grille. Sedan, without CTS V, without vsport, 2014-15. Without zr2 & zr2 bison, Colorado, #2. Sedan, without gxp street edition. Without zr2 & zr2 bison, Canyon, #2. Cadillac Escalade EXT, upper. With CTS V, bumper & mounting. Suburban, cover & components. Yukon XL, cover & components. 2014-15, all-Terrain pkg. 2015-16, Colorado, lower. Without CTS V, 2016-19. 2015-16, Canyon, lower. Sse & ssei, 1996-99. Type 3, SS & sport. With Impala SS. Lt, LS, 2016-18. Escalade ESV. LS & lt models. 2008-11, STS. Coupe, CTS V. Se, sle & ssei. SS, 2016-18. SS model. H2 sut. Gt. Lt & ltz. Type 2. 4 door. 2012-13. With xr. With ev. 2001-04. 2005-06. 2010-13. 2001-06. With xe. 1995-97. Halogen. 2005-07. 2014-16. 2007-12. 2017-19. 1994-96. With z28. 2013-16, #1. 2015-16, #1. 2016-18, #2. Hatchback. 2013-2017. 2014-2015. 2008-2012. Chevrolet. Without gs. Right side. 2006, front. Without hid. Without awd. 2013-2014, #3. Without zr1. Ltz, premier. Coupe, with v. With redline. 2008-09, upper. 2009-12, inner. 2004-05, lower. 2012-16, lower. 2004-08, inner. Convertible, #2. Running board. Splash shields. 2017-18, type 1. 2012-16, with rs. With corner step. 2016-19, stingray. Fender & mounting, #2. Without gxp model. With sport, 2008-09. 2002-05, base model. With dual tailpipe. 2013-16, with denali. Without v, 2013-2014. Gmc, trim & electrical. 2014-15, without led. Fender & shields, lower. 2.0L turbo, 2014-2017. Without sport, 2007-09. 2013-17, without denali. Without high intensity. 2010-15, without denali. 2014-15, trim components. 2016-18, trim components. Gmc, with denali, cadillac. Without high output, rear. 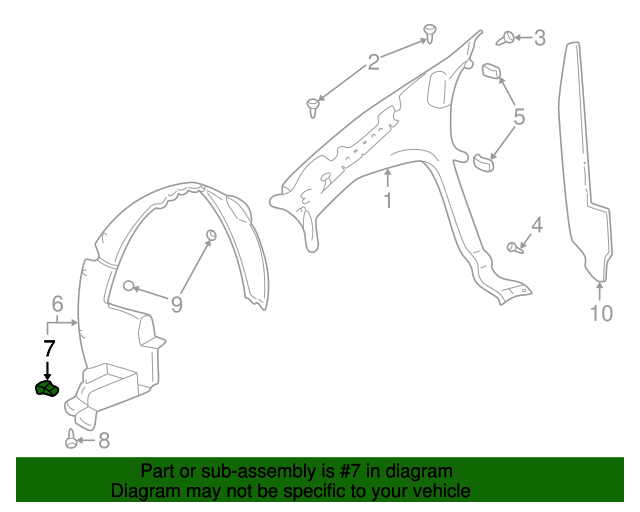 Upper components, 2010-12. 2016-17, upper components. 2013-16, lower components. 2015-16, lower components. 2016-17, lower components. Bumper cover & trim, 2016-18. 2013-16, upper components, #2. Without zl1 & rs pkg 2014-15. Left side without dual doors. Energy storage module cooling, 2.4L. Driver side, without enhanced speaker system. Notes: Included With Tail Lamp Assembly. Included With Fog Lamp Assembly. Included With Rear Rocker Molding. Included With Headlamp Assembly. Included With Bumper Assembly. Included With Lower Deflector. Included With Guide Bracket. Included With Grille Assembly. Included With Carrier Assembly. Included With Wheel Opening Molding. Included With High Mount Lamp. Included With Stiffener. Included With Upper Grille. Included With Lower Quarter Trim. Included With Wheelhouse Liner. Included With Lower Bracket. Included With Bumper Cover. Included With Underbody Shield. Included With Lower Extension. Included With Fender Liner. Included With Upper Bracket. Included With Grille Surround. Included With Outer Support. Included With Outer Brace. Included With Side Cover. Included With Front Rocker Molding. Included With Trim Bezel. Included With Bumper Filler. Included With Skid Plate. Included With Spoiler. Included With Mud Guard.